Oil prices have jumped again in recent weeks, and some analysts expect further increases. That would be dreadful news for American Airlines. In recent years, American Airlines (NASDAQ:AAL) CEO Doug Parker has been one of the most adamant proponents of the thesis that consolidation has permanently transformed the U.S. airline industry, leading to a new era of prosperity for the sector. If Parker is right, you wouldn't know it from his company's flagging results. The U.S. economy is stronger than it's been in over a decade, yet American Airlines' pre-tax profit is set to plunge for a third consecutive year in 2018. A recent surge in oil prices will make matters worse in the fourth quarter and in 2019 -- particularly if fuel costs continue to move higher. As a result, even though American Airlines stock has plunged more than 20% year to date, it still doesn't look particularly attractive. American Airlines year-to-date stock performance; data by YCharts. The price of Brent crude, the global oil benchmark, has surged nearly 50% over the past year, recently surpassing $80 per barrel. The last time it approached that level, back in May, I warned that higher oil prices could spell disaster for American Airlines' profitability. 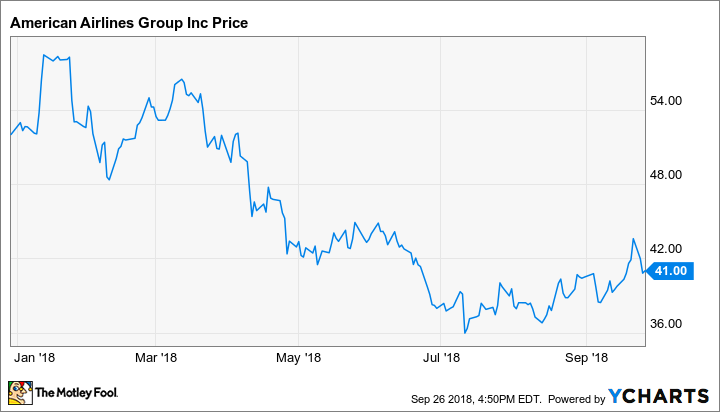 Oil prices moderated over the summer months, yet American Airlines was still compelled to slash its earnings guidance for the second time this year in late July. Revenue per available seat mile (RASM) has been growing, but not fast enough to make up for the carrier's higher fuel bill. As a result, American now expects to produce earnings per share between $4.50 and $5.00 for the full year, down from its original 2018 EPS forecast range of $5.50 to $6.50. By Monday, the price of Gulf Coast jet fuel had reached $2.22 per gallon. After factoring in fuel taxes and transportation costs, this likely translates to an "all-in" fuel price of at least $2.40 per gallon. For comparison, American Airlines' most recent guidance assumed an average fuel price between $2.18 per gallon and $2.23 per gallon for the fourth quarter. If fuel prices remain at today's level, American will face roughly 2 percentage points of incremental margin pressure from higher fuel costs next quarter (compared to the July forecast). That could put the company's full-year EPS forecast in jeopardy yet again. Can unit revenue keep up? American Airlines' adjusted pre-tax margin peaked at 15.3% in 2015 before falling to 12.6% in 2016 and 9.1% last year. Based on the company's most recent guidance, adjusted pre-tax margin is set to come in between 6% and 7% this year. American Airlines' profitability has plunged over the past three years. Image source: American Airlines. In that context, it's more critical than ever for American Airlines to achieve strong unit revenue growth to offset the impact of fuel costs on its profitability. Unfortunately, the company's third quarter outlook called for RASM to rise just 1% to 3% year over year: in line with to slightly below the 2.8% increase recorded in the first half of 2018. American is making a number of important adjustments to improve its unit revenue trend. For example, it recently joined most of its top competitors by raising checked-bag fees. On a more customer-friendly note, it now allows people who buy basic economy tickets to bring full-size carry-on bags, unlike United Continental. From a network standpoint, American Airlines is eliminating some unprofitable flights to Asia in favor of more promising European markets. It is also focusing its domestic growth on its three most profitable hubs: Dallas-Fort Worth, Charlotte, and Washington, D.C. However, while these are steps in the right direction, American will face tougher year-over-year comparisons going forward. Indeed, RASM rose just 1.1% in the third quarter of 2017 but surged 5.6% in the fourth quarter. This situation makes it very unlikely that RASM growth will accelerate next quarter relative to Q3. American Airlines expects non-fuel unit costs to increase 1% to 2% next year. If that forecast is accurate, and if jet fuel prices remain near current levels, the carrier will need unit revenue to rise 2% to 3% year over year for its pre-tax margin to hold steady in the 6% to 7% range in 2019. Yet several recent reports have suggested that oil prices could rise as high as $90 per barrel or even $100 per barrel next year, largely because of the impact of U.S. sanctions on Iranian crude oil. For each $10 increase in the cost of a barrel of crude oil, American Airlines would need more than 2 percentage points of incremental RASM growth to hold its pre-tax margin steady. While American Airlines could improve its profitability again in 2019 if oil prices stay at current levels or decline from here, another uptick in oil prices could cause its pre-tax margin to fall even more. That situation would send free cash flow further into negative territory. 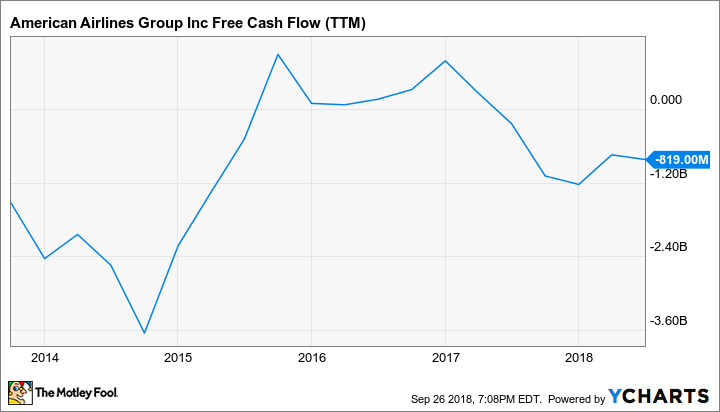 American Airlines Free Cash Flow (TTM), data by YCharts. TTM = trailing 12 months. A further downturn in free cash flow could be particularly unpleasant because American Airlines has more than $8 billion of debt maturing between 2019 and 2021. The combination of rising interest rates and American's declining profitability could make it expensive to refinance this debt. On average, analysts expect American Airlines' adjusted EPS to rebound to $5.74 next year, up from an estimated $4.67 in 2018. This is certainly a plausible outcome if fuel price pressure eases. However, it's possible that fuel prices will continue rising instead. American Airlines is in a poor position to cope with such a situation, because of its low profitability and high debt load. As a result, shares of the largest U.S. airline are still a no-fly zone for investors.